When an average of 28.25 million viewers tuned in for the inaugural College Football Playoff games, easily besting the 25.6 million viewers who tuned into the final BCS Championship Game, the most fascinatingly lucrative subplot of the whole CFP experience became the fantastic sum of money ESPN could potentially charge for airtime during the championship. 28 million eyeballs is a stunning number. Not Super Bowl-level tack-hammer-to-the-forehead floored, but stunning nonetheless. ESPN is reportedly fetching $800,000 to $1 million for 30 seconds of time. While that falls significantly short of the reported $4.5 million/30 seconds NBC is charging for time in this years Super Bowl, it still represents a significant chunk of change. With that kind of money on the line, only the big hitters are coming to play. Some normal whales — Allstate, GM, Northwestern Mutual — have already confirmed their buys, and Dr. Pepper sponsors the trophy, so Larry Culpepper is, unfortunately, going nowhere. But considering the high price of commercial time, and the assumed high demand for that time, companies need to be selective. And among those companies figuring to advertise during the Natty is DirectTV, current purveyor of Bizzaro World Rob Lowes. For the somehow-uninitiated, the Rob Lowe spots follow a formula, like all campaigns: Normal, dashing Rob Lowe has DirectTV and is infinitely happier for this choice, while Cable Rob Lowe has cable and also some usually strange deformity. There are lots of these, and like anything besides bananas — because identical genetic makeups and stuff — they were not created equal. So, to officially sort out something that definitely doesn’t need sorting, official or otherwise, I present the Definitive Cable Rob Lowe Power Rankings1! 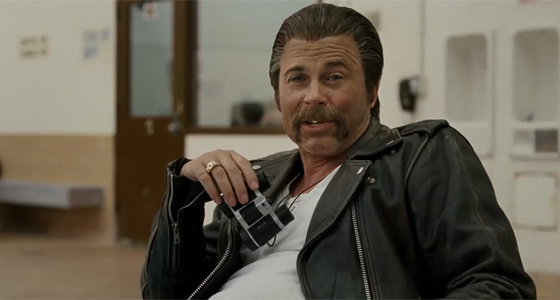 Creepy Rob Lowe wears a dirty leather biker jacket. He has a mustache that is planning a chin invasion. His hair is slicked with what one can only assume is a special combination of bacon grease and chest sweat. He holds binoculars like he’s used them before, which is a sufficiently creepy thing for any non-hunter, non-veteran, non-mariner to be proficient with. He openly admits to liking the smell of strangers’ hair. He has a belt buckle with wings on it, too. He treats the rec center swimming pool the way most people treat movie theaters. He treats movie theaters the way most people treat strip clubs. His creepiness is not to be fucked with. CRAZY HAIRY ROB LOWE DOESN’T NEED A SHIRT CUZ CRAZY HAIR ROB LOWE HAS ARMHAIR CURTAINS AND ROCKS HUMAN HAIR CREWNECK SWEATERS AND HANGS OUT AT BARS THAT STILL HAVE PAYPHONES AND THAT VEST. Less Attractive Rob Lowe is basically just Super Creepy Rob Lowe without the self-confidence or suaveness of what we can all assume is a lifetime creep with a rap-sheet of idiosyncratic offenses. His hair is considerably thinner, and his face is absent the Offerman-meets-El Paso Stash, but the bullet points are the same: doughier than the original, consciously longer haircut, white undershirt. Where LA Rob Lowe loses points: Dirty undershirt, lack of confidence, no belt buckle. Where he gains points: His shirt kind of matches his couch. Also, while it’s no 1080p, his TV does get picture. And sound. This Rob Lowe hangs pictures of himself flexing on the walls of his home gym, which is awesome, and he loves to say the word bro, bro. He’s also intrepidly swagger-jacking all four dudes from the Jersey Shore at the same time, which is both insanely impressive and hard to do. His tanning machine is always set to crispy. Maybe it’s because I haven’t spent enough time with Meat Head Rob Lowe yet — he’s the newest member of the crew — but he would be far higher on this list if there wasn’t a latent annoyance factor bubbling beneath the surface of his toned, bronzed outer layer. Scrawny Arms Rob Lowe is a force of nothing. His arms won’t allow for it. He could wear empty toilet paper rolls as sleeves to complement the rocking tank top he’s donning, but that would hide his tragically slender arms. The avid ping pong fan can’t get to his mayonnaise, but he doesn’t need to. He’s got a killer hairline and an apartment with retro appliances. To say that Painfully Awkward Rob Lowe didn’t suffer from getting pulled in November would be lying. But to say that Painfully Awkward Rob Lowe is objectively better in any way than any of the other Cable Rob Lowes would also be lying. This is the weakest Rob Lowe of the bunch. His pants are predictably infiltrating the zone our bodies have mapped out for a rib cage, his hair is done up like a non-human character from the Mario franchise and he’s wearing a fanny pack. Even after the bathroom stage fright is forgiven, he’s a bummer.